Hull City boss Marco Silva says the club want him to remain in charge in the Championship next season but he is yet to decide on his future. 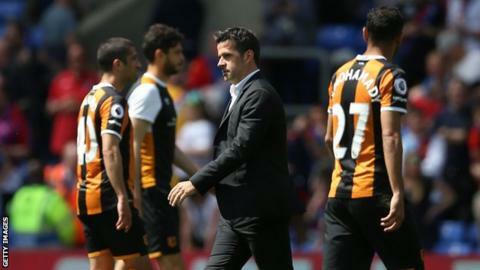 The Tigers were relegated from the Premier League after a 4-0 defeat by Crystal Palace on Sunday. Silva, 39, who took over at the KCOM Stadium in January, has been linked with a move to Watford to replace the outgoing Walter Mazzarri. "It's my goal as a manager to work in the Premier League," said Silva. "It's a big decision - in this moment I don't have a decision and I need to analyse what is best for my career." The Portuguese said he will meet Hull's owners on Wednesday to give his decision, following his side's final game against Tottenham on Sunday. "We met this week and they showed they have an interest in keeping me and my staff at the club," Silva told BBC Radio Humberside. The former Sporting Lisbon and Olympiakos manager said he had not received an offer from Watford or any other club. "Everyone knows when you have the chance to work in the Premier League, you don't want to work in Championship, it's normal," he added. "Of course the club want to keep me and now it is not just whether I want [to stay] or not - I need to analyse other things." Silva led Hull to six wins in eight home games after replacing the sacked Mike Phelan, but was unable to register an away victory.